One of the many advantages of choosing vinyl siding is the vast array of colors available for your home's exterior. From a traditional hue to something modern, use these tips to choose the right color for your home. The first thing to do is decide what types of vinyl siding colors work best with the architecture of your home. You may not want a bold, vibrant color on a traditionally styled home, or a subdued neutral color on a modern, contemporary design. Pick a color that works with, not against, the style of your home. Make sure to also consider how your house siding color will fit in with your community. This doesn't mean your house has to be the exact same color as your neighbors. Just look for a color that will complement the neighborhood and not be an example of "one of these things is not like the other." While certain colors, such as white and beige, are available from practically every manufacturer, other colors may be exclusive to specific producers. If you can't find a color you like from one manufacturer's product line, check out the vinyl siding colors from other manufacturers. Some of the leading manufacturers include CertainTeed siding, Mastic Home Exteriors and Crane Siding. In order to have the most siding color choices, you'll want to check out premium, vinyl siding options. While the standard vinyl siding lines may offer about a half-dozen choices, the premium vinyl siding lines may include 20 colors or more. For example, the Crane Siding Premium Point 360 line offers 18 choices, including four bold selections, while the CertainTeed Monogram 46 line of siding offers 39 distinct color options. Some manufacturers will make custom runs of vinyl siding to your color specifications. This is an excellent option, if you can't find the exact color you want in any of the standard choices. Just know that it will be more expensive then buying your siding "off the rack." 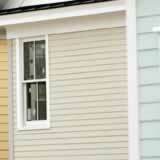 By following these tips you are sure to find the perfect vinyl siding color for your home.